Each year around Memorial Day, D.C. readies itself for the rumble and roar of motorcycles, as hundreds of thousands take to the streets for the annual Rolling Thunder rally. WASHINGTON — Each year around Memorial Day, D.C. readies itself for the rumble and roar of motorcycles, as hundreds of thousands take to the streets for the annual Rolling Thunder rally. This year, that roar came a few weeks early — only leather jackets were swapped for onesies and double strollers replaced Harley-Davidsons. The inaugural Strolling Thunder event took place Tuesday, May 2 on Capitol Hill. 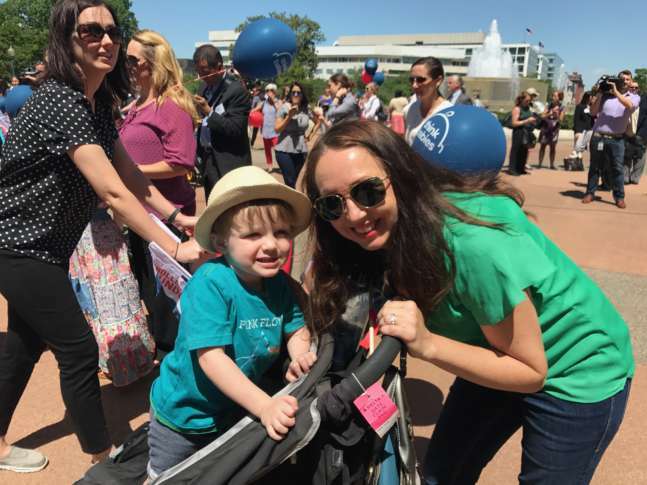 Hundreds of families from all 50 states and the District of Columbia met in Upper Senate Park to rally and march for legislation that supports babies, toddlers and their parents. “The science has become clearer and clearer every year,” said Matthew Melmed, executive director of the nonprofit Zero to Three, which organized the event. Research shows that between the ages of 0 and 3, a child’s brain produces 700 new neural connections every second, and social and emotional relationships established early in life lay the foundation for future years. Experts say everything from access to affordable child care to more paid parental leave can help ensure young ones are set up to succeed during the most critical years. Erica Yamauchi and her 17-month-old daughter took two different planes and flew for 12 hours to attend Strolling Thunder. The Honolulu, Hawaii, resident wanted to make sure her representatives and others on the Hill knew the hardships Hawaiians face when it comes to raising a family. Yamauchi said her state lacks universal preschool and the cost of child care, in addition to the cost of living, is astronomical. She wants to see more options for affordable care and wants more paid time off for parents to bond with their children in their first few years of life. “It’s really easy to forget what it’s like to have babies and toddlers and how hard it can be on families,” she said. Elizabeth Wahl flew in from Janesville, Wisconsin, for a similar reason. Wahl says her family has been fortunate enough to find quality care for her 11-month-old son, but knows that is not the case for other families back in her region. “The trick is finding high-quality child care that’s also affordable. No family should have to sacrifice quality for affordability when it comes to the most important people in their lives,” Wahl said. At Tuesday’s event, strollers were decked out in signs that read, “My brain is growing faster than yours” and “The future begins with babies.” Strolling Thunder flags were taped to stroller handlebars to imitate the flags motorcyclists fly during the Rolling Thunder rally. Many families in attendance met with their representatives before the rally, and Zero to Three’s Melmed is hopeful their stories will stick. “We’re hoping either the wheels make enough sound or the babies make enough sound that they can be heard inside that Capitol dome,” he said.